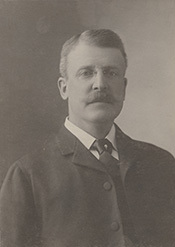 WILLIAMS, George Fred, a Representative from Massachusetts; born in Dedham, Norfolk County, Mass., July 10, 1852; attended private schools, and was graduated from the Dedham High School in 1868 and from Dartmouth College, Hanover, N.H., in 1872; studied at the Universities of Heidelberg and Berlin; taught school in West Brewster, Mass., in 1872 and 1873; became a reporter on the Boston Globe; member of the Dedham school committee; studied law at Boston University, Boston, Mass. ; was admitted to the bar in 1875 and practiced in Boston; edited Williams Citations of Massachusetts Cases in 1878 and volumes 10 to 17 of the Annual Digest of the United States 1880-1887; member of the State house of representatives in 1890; elected as a Democrat to the Fifty-second Congress (March 4, 1891-March 3, 1893); unsuccessful candidate for reelection in 1892 to the Fifty-third Congress; was an unsuccessful Democratic nominee for Governor in 1895, 1896, and 1897; resumed the practice of law in Boston, Mass. ; delegate to several State conventions; delegate to the Democratic National Conventions in 1896, 1900, 1904 and 1908; Minister to Greece and Montenegro in 1913 and 1914; resumed the practice of law until his retirement in 1930; died in Brookline, near Boston, Mass., July 11, 1932; interment in the Old Village Cemetery, Dedham, Mass.